The frontier traditions shaping our nation's culture declare a saloon to be more than simply a liquor dispensary, instead ranking alongside the town church as a community social center, serving as ballroom, hotel, dining hall and funeral parlor as needed. Its elevated status may account for the number of American plays set in barrooms, from The Iceman Cometh and The Time of Your Life to The Sea Horse. 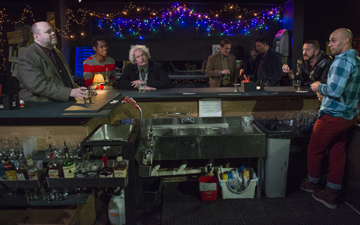 What distinguishes designer John Holt's configuration of the watering-hole providing the setting for Red Orchid's production of Grant James Varjas' Accidentally, Like a Martyr is that, rather than locating its customers in the foreground of the stage picture, he exposes the working area behind the bar, rendered in hyper-realistic detail, to the purview of an audience seated at such close proximity that front-row playgoers could easily stretch out a hand and snag an olive or two from the condiment tray. The verisimilitude of the shabby cocktail lounge replicated in a space measuring a mere eighteen by thirty feet owes its authenticity to the real-life Second Story bar on Michigan Avenue—a prototype recognized by several opening-night theatergoers. Holt freely admits to copying its decor. "Varjas sets his play in lower Manhattan, but we—myself, and Shade Murray, our director—found the Second Story environment so well-suited for the tale we wanted to tell, we incorporated as much of it as we could into our visual concept. The mirrors, light fixtures, even the shape of our bar, are modeled on the Second Story, and built from scratch by our tech director, Jim Moore." The Red Orchid budget mandates relying on its artistic staff's acquaintances in the food and drink industry for most of the play's furnishings. Property supervisor Arianna Soloway reports, "The Kamehachi restaurant next door let us borrow a lot from their storage rooms, though the sink came from a used restaurant equipment store near Joliet. We found the juke box in Kenosha—it was in the owner's basement. He said that he got it maybe twenty years ago from someone whose car he'd repaired. He sold it to us for a really good price because it took up so much room, and he wanted to redo the basement." How functional are the tools utilized in the course of the dramatic action? "The bar's refrigerator doesn't work, so the fruit garnishes are stored in the office upstairs at night." says Soloway, while Holt recalls director Shade Murray asking for an operational soda gun, leading to the invention of "something improvised out of pressurized paint sprayers"
The libations specified in the script encompass, not only simple combinations of hard and soft beverages, but complicated concoctions involving blenders and chipped ice, such as Grasshoppers—all tasks new to Dominique Worsely, the actor whose duties include the assembly thereof. "Shade and John are both experienced bartenders," Soloway confides, "Not only did they supervise the back-of-the-bar arrangement to accommodate the paths of the actors' interactions, but they transformed Dom into a credible mix-master in no time! It was fun to watch his professional panache increase during rehearsals." Has there been any problem with spectators handling the bar props? "You mean like helping themselves to a fake beer?" laughs Holt, "No, I'm not aware of any problems, but the ushers are alert to that possibility and are careful to see that audiences navigate the space without doing any harm to the stage!" Accidentally, Like a Martyr runs at Red Orchid Theatre through March 15.